Leostar Panchang software is very popular among astrologers. Those astrologers who wish to release their own Panchang can create Panchang of any year by using this Panchang software. It helps in calculating accurate and error free Muhurat. It gives daily Panchang (Almanac) from 0 to 9999 in which one can see Samvat, month, Tithi, sunrise and sunset time, Dinman (duration of day), Ascendant timeout period, sidereal period, tenth house, ascendant table, Panchang - Sunrise, Moonrise, Tithi, Nakshatra, Yoga, Karan, Vaar, Rashi, Sun Sign, Sun Star, Rahukaal, Hora, Chaugadia, Panchak, transit Moon, transit Sun, Lagna, transit & motion of planets. It is also known as Panchang, Panchangam, Hindu calendar and Hindupanchang. Apart from Panchang calculations and predictions it also contains comprehensive and complete astrology solutions required by an astrologer for making predictions in its Astrology module i.e. planet aspect, Bhava aspect, cusp aspect, Saptvargas, Shodash Vargas, Varga Bhedas, Vimsopaka, Satvargas, Shodash Vargas, Varga Bhedas, Vimsopaka, Karaka, Avastha, Rashmi, Nakshatra Reading, Mahadasha and Antardasha analysis and Transit predictions for next 30 years, More than 500 astrological combinations, transits till 9999, the combinations and remedial measures for inauspicious Yogas like Manglik dosh, Kaalsarpa Yoga and Sadesati etc. have also been given in detail. With this Kundli software various divisional charts can be made accurately. Create Panchang containing Tithi, Vaar, Nakshatra, Karan, Yog for any year. Price analysis, Sarvadobhadra Chakra, Transit of Planets, Result of Transit. Astro software Leostar is known for getting minute calculations. This astro software is an ocean of astrological knowledge. Astro software Leostar can cast lagna, chalit, cusp, sun, moon, hora and divisional charts. Astrologers use different Dashas for getting accurate predictions. Different types of Aynanshas used in astrology like Lahiri, Kp, Raman, Jaimini, Bhrigu, Manu and Sayan are available in it. For astrologers this vedic astrology software is like a miracle. All horoscopes can be saved in it. This vedic astrology software contains longitudes and latitudes of 1 Crore cities. Tables of Panchang – Titthi, Vaar, Karan, Nakshatra and Yog for any point of time. Ephemeris report, combustion report, Nakshatra entry report, Nakshatra sub lord, Rahu kaal / Gand Mool, Badra, Panchak, rise / set of moon, Rashi entry report, retrogression report, Sarvarthsiddhi Yog, Amritsiddhi Yog, Dwipushkar Yog, Tripushkar Yog, Gurupushya Yog, Ravipushya Yog and transit. Ascendant Table - Ascendant timeout period, sidereal period, tenth house, ascendant table. Panchang degrees - daily ascendant, daily degree starting, Nakshatra starting, Rashi / Nakshatra start, daily sun lagna, daily sun degree starting, sun sign/nakshatra starting, Chandra daily Ascendant, daily moon degree starting, moon sign/ nakshatra starting, And so on for all the other planets. And Aynansh. Starting & ending time of Nakshatra, Tithi, Karan and Yoga. Yoga – Auspicious and inauspicious Yogas have been incorporated like - Sarwarth Siddhi, Amrit Siddhi, Tripushkar, Dvipushkar, Sun Pushya, Guru Pushya, Rajprad, Prashast, Mrityukal, Dagdha, Visha, Hutashn and Yamghantak. This type of yoga is formed, its associated rules are also given. Rahukal - Rahukal, Hora, Chaugdia. Transit Transit moon, transit sun, Tithi, yoga, Lagna. Daily Almanac from 0 to 9999 in which you can see Samvat, month, date, sunrise and sunset time, Dinman(duration of day) and ending time of Star, Karan and yoga Could be changed on a monthly or yearly basis. With Leostar Panchang software the comprehensive calculation of Panchangam for each day can be calculated for the entire year, week or month instantly. The most important advantage of this software is that there is no need to carry regional Panchangs as Leostar Panchang gives accurate Panchang for all places. Leostar Panchang software can be used to know the Panchangam of any day. Avakhada , Ghatchakra, Tara Chakra, Panchang, Calendar. 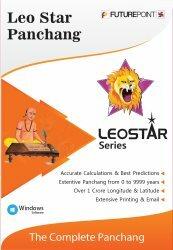 The modules that one gets in Leostar Panchang software are Teva, Astrology, Panchang, Mundane & Tables. Astro Software Leostar can cast all types of charts like Lagna, Chalit, Bava cusp and various types of divisional charts. This astro software contains calculations related to Shadbal, Jaimini, Karakavastha and Sudershan Chakra. KP System, KP Significator, Shodasvarga Tables, Upgraha, Sannadi Chakra etc are included. Prashar Ashtakvarga, Ashtakvarga Chart & Ashatak ascendant are also given in this astro software. Nakshatra Reading, Mahadasha & Antardasha analysis & Transit predictions for next 30 years are incorporated in this astro software. More than 500 yogas (astrological combinations)have been included in this astro software. This astro software shows Transits to view planets moving around the natal horoscope. This astro software contains reading material for Palmistry, Numerology, Vastu, Astrology and 21 Horary tools. Not only the students and expert astrologers can get accurate calculations but they can also use the horoscopes given in the databank of this astro software. User can get additional information like Astrograph, Longevity, Kalsarp dosha, Sadesati vichar, Manglik vichar and Remedies etc. too from this astro software. Prescription of stones along with the method of wearing it has also been given in this astro software. Mantras are also recommended along with the articles of donation for propitiating planets. Remedies for Sadesati are also given in detail. Reports from Futurepointindia.com are 100% genuine. These reports are pen down by your chosen consultant after analyzing your horoscopes in light of query raised by you. Only your chosen consultant works on order placed by you. I was getting battered by life from all sides and there seemed no respite, but that was until i took this amazing personalized report.All my problems are long gone.People around me are simply amazed.Thank you for changing my life!